Something happened to me a few weeks back; I saw a new, green Mercedes-Benz – Olivine Green, as I would later learn – in the parking lot at the gym. And yes, in addition to my actually making it to the gym, seeing a new green Mercedes is Earth-shattering stuff. Allow me to explain. Among my many Achilles' heels as a budding automotive pundit is my selection of daily driver that’s more suited to an elegant Beverly Hills housewife in her 70s than an ageing 43 year old hipster living in Silver Lake. It’s a 1994 Mercedes SL320 convertible, which is much less powerful than the mightier, better selling SL500 also offered at the time. Mine further eschews conventions of its day as it’s not black, nor silver, nor even white (perhaps with gold AMG badging? ), but rather Spruce Green with Saddle (aka brown) interior. It’s appropriately nicknamed “The Old Girl” as I bought it from my mother (the above-mentioned housewife) in 2008 when I moved back to LA from NYC. So I have something of a soft spot for green Mercedes. Green, as Maggie Smith quipped in 2001’s Gosford Park, is a “difficult color.” Perhaps that why it’s been absent from the automotive palette in the USA for such a long, long time. Back in the 80s and 90s, Mercedes, Porsche, Volkswagen and BMW routinely offered at least one verdant option, and true to its "British Racing Green" roots as that country's designated racing color, so did England's Jaguar and Range Rover. Jaguar's Sage Green (on the Series III XJ Vanden Plas saloon) was particularly elegant, and the signature color combination for Range Rovers of the era, not to mention millions of Eddie Bauer Edition Ford Explorer SUVs, was forest green with tan interior. Perhaps we all just got sick of the stuff? Now a handful of green machines are back to whet your appetite. Olivine Green was first offered on the launch edition of the Mercedes E550 Coupe in 2009, and was also chosen for the launch edition of the E550 Cabriolet the following year. Sadly the color has since been dropped, but Mercedes continues to offer Verde Brook on its GL-Class SUV, CL-Class coupe and outgoing S-Class sedan (which is also available in Jade Green). 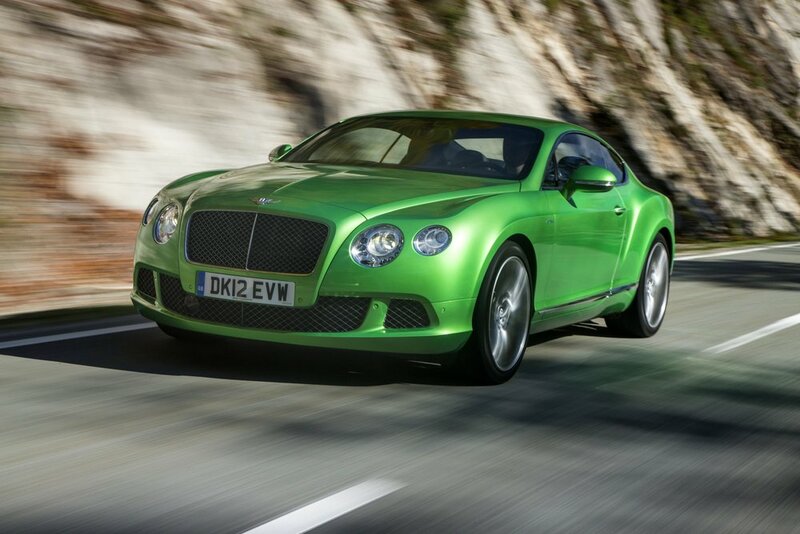 The Bentley range offers traditional options including Verdant Green and Midnight Emerald, and now, the deliciously unexpected Apple Green which debuts on its new Continental GT Speed. Reminiscent of a green apple Jolly Rancher candy, it's a color you can almost taste. Porsche adds a squeeze of citrus effervescence and innovation to create Lime Gold, which was chosen as a launch color for the 2013 Porsche Boxster featured predominantly both in printed marketing materials and in Porsche’s web-special online; the color is also optional on the 911 Carrera. It’s worth noting that manufacturers carefully consider which colors are chosen to spotlight new models at launch as they make that very important first impression; it can also be an opportune time to test interest in new colors and paint technologies before determining whether to make them more widely available across the range. Porsche has also been instrumental in seeding the brown trend - as reported by my colleague Brett Berk for Yahoo Motors - and together with its new adventures in “greenland,” the mark is revisiting color as a sensory means of asserting its design leadership. Iconic use of color is nothing new for Porsche, just take a look at the red, yellow, green and orange 911’s of the 60s and 70s. Now it is widely speculated that Porsche is readying a new-generation 911 Targa that will bring back its signature stainless steel roll bar and removable roof panel it lost in the late 80s. A 2015 Porsche Carrera Targa in Lime Gold? Just the thought makes me happy. Why the green light? When the fever finally broke for fifty shades of grey – meaning the silver and charcoal hues that dominated car sales for the past two decades – white took its place, becoming the #1 car color (both in the United States and around the world) for the first time in 2012. White conveys purity, reflecting our hopes for a cleaner, greener environment. True green, of course, is the genuine article. Sandy McGill, Lead Designer at BMW Group DesignworksUSA, explains that green’s comeback signals a shift in our cultural attitudes. “Like brown, green is a more liberal, progressive color that reflects the times we are living in, and is more experimental in terms of psychology than a generally conservative color such as blue. Plus in automotive we’re moving towards new fuel technologies and new ideas of mobility, and green further conveys this innovative, out of the box mindset,” says McGill. At BMW customers can choose from four different shades of green on a special order basis - Java Green, Malachit Green, Oxford Green and Fir Tree Green – available on the 3, 5, 6, and 7-Series, as well as the Z4 Roadster. I frequently spot the Toyota Prius in Sea Glass Pearl, and while there aren’t so many Ford Fiestas in Los Angeles, many that I’ve seen are Lime Squeeze. Fiat’s 500 is offered in three distinct shades: Verde Oliva (Olive Green) conveys luxury; Verde Azurro, which is really more blue than green, feels playful yet modern; and the non-metallic Verde Chiaro is reminiscent of avocado-colored kitchens and appliances from the 70s. About a third of the Kia Souls I see are “Alien” (no-kidding), and the Hyundai Tucson featured for past two seasons on “The Walking Dead,” although it may be hard to discern due to the grime, blood and zombie entrails - is Kiwi Green. “Green can be an expression of nature or, if a more acidic tone, it can be radioactive and chemical. Likewise it can be conservative or Avant Garde,” says McGill, noting green’s versatility to convey a range of aesthetics and emotions depending upon its chosen shade and hue.